The Off the Block/Springbak, Inc. Freshmen All-American Team honors the top NCAA Division I-II men’s volleyball freshmen players from the regular season. This is the fifth year Off the Block and Springbak, Inc. have presented the national honor, and it remains the only Freshmen All-American Team presented in college men’s volleyball. Four teams that qualified for the NCAA Tournament — Long Beach State, BYU, Ohio State and UC Irvine — had one player make the Freshmen All-American Team. Lewis led all schools with two Freshmen All-Americans, while Limestone Loyola, Pepperdine and Stanford each had one player earn the national honor. 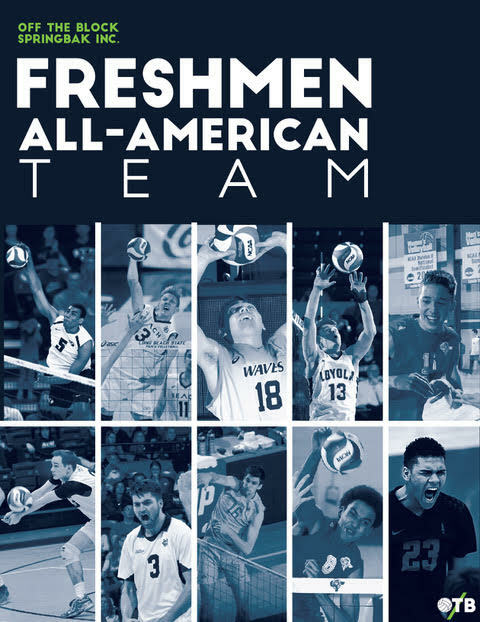 A voting committee of about 25 men’s volleyball coaches and volleyball media members from around the nation determined the Freshmen All-American Team. A player making the Freshmen All-American Team had to be among the top 10 vote-getters and appear on at least one-fourth of all the fully submitted voting ballots. Off the Block annually presents college men’s volleyball national awards to recognize outstanding individual performances in the sport. Along with the Freshmen All-American Team, Off the Block and Springbak, Inc. during the regular season presents the National Freshman of the Week and in the postseason presents the National Freshman of the Conference Postseason. Springbak, Inc. is the official sponsor of the 2018 Freshmen All-American Team and produces high performance footwear used by professional athletes from the NFL, NBA, MLB and U.S. Olympic teams and the top college teams in the nation. Anderson had a .490 attack percentage and at least five kills in 17 regular season matches, including a season-high nine kills while hitting .500 in a victory against UCLA in February. The middle attacker was among the national among the national leaders with a 0.84 blocks per game average as he helped Long Beach State win the Big West championship. Fernandez was in the nation’s top 25 and third among freshmen with a 3.44 kills per game average, including having double-digit kills in 21 regular season matches. The two-time recipient of the Springbak/Off the Block National Freshman of the Week also was fourth in the MPSF averaging 0.48 aces per game average and helped lead BYU to the MPSF championship. Hanes was in the nation’s top 20 and second among all freshmen with a 3.55 kills per game average, including having double-digit kills in 16 regular season matches. He also was second in the MIVA with 37 kills had three consecutive matches with three aces in wins against George Mason, Ball State and Fort Wayne. Jasper led all freshmen and was seventh in the national among all players with a 3.92 kills per game average. The opposite had seven matches with at least 20 kills, including a season-high 27 kills on a .535 attack percentage in a four-game victory against UC San Diego in March. Mitchem was in the nation’s top 15 and led all freshmen with a 1.12 blocks per game average. He also was eighth in the nation with a .394 attack percentage, including having a season-high 12 kills on a .667 attack percentage in a conference victory against McKendree in February. Mullahey was fourth in the nation and led all freshmen with a 10.58 assists per game average while also leading Pepperdine to a top-10 attack percentage in the nation at .294. In addition, Mullahey had at least five digs in 15 regular season and helped the Waves finish in third place in the MPSF. Murray was in the nation’s top 30 and fifth among all freshmen with a 0.97 blocks per game average. The middle attacker also finished with a .439 attack percentage and had a season-high 11 kills while hitting .647 in a non-conference victory against CSUN in February. Ruhm led the nation with both a 3.16 digs per game average and 316 digs. The German native libero had double-digit digs in 16 regular season matches, including a season-high 20 digs in a four-game victory against North Greenville in February. Schneidmiller was in the nation’s top 20 with a .333 attack percentage and led all freshmen in the Big West averaging 2.61 kills per game. The 2018 Big West Freshman of the Year also had a season-high 19 kills on a .424 attack percentage in a five-game victory against BYU in January and helped UC Irvine earn an at-large bid to the NCAA Tournament. Zolg was seventh in the country with a 10.32 assists per game average and guided the Loyola offense to the nation’s eighth-best attack percentage at .308. The 2018 MIVA Freshman of the Year also was in the top 10 of the conference averaging 2.02 digs per game average as he helped the Ramblers earn a share of the MIVA regular season championship.